I haven’t done a lot of baking recently, but Valentines Day is generally an excuse for tasty cake in our house – and baked cheesecake is hubby’s favourite, so that’s what I made. Buying the ingredients and preparing the cake was, by necessity, all last minute – with a new baby due to arrive any day I didn’t want a bunch of ingredients sitting around in the fridge not being used because I was otherwise occupied. Luckily for hubby, baby did not make an appearance on Friday 13th. 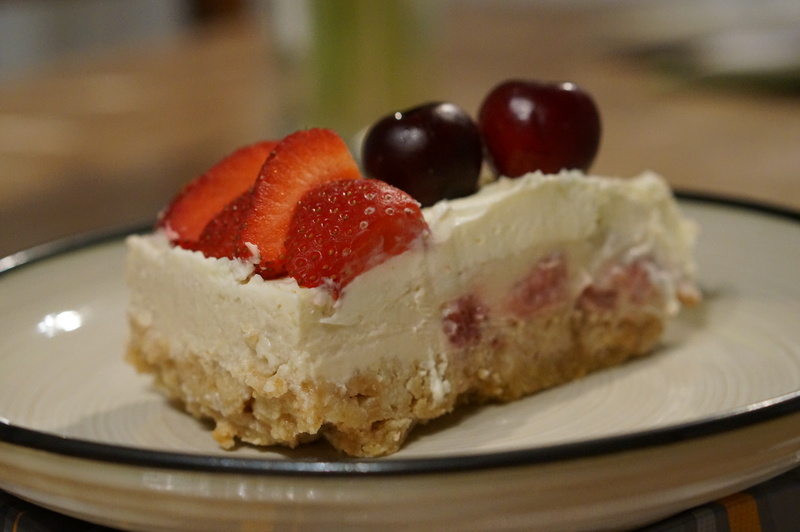 This is a fairly easy cheesecake to make, although there are a few stages to it. For starters, you do the standard ‘melt butter/ bash up biscuits/ mix together and put in the fridge to set’. Stage 2 is making the actual cheesecake mixture. Again, fairly simple – just mix together 600g cream cheese, an egg and 100g caster sugar. What you do need to do is add a boiled strawberry mixture to this. The strawberry mixture contains (funnily enough) 200g strawberries, 80g caster sugar and 30ml water. (Having said that, this nearly ended up being a cherry mixture because the first shop I went to had no strawberries. It probably would have worked, but I’m glad I found strawberries in the next shop because I don’t like messing up gift bakes)! You boil all this together and then wait for the strawberries to go soft and the liquid to reduce by half. Once the strawberry mix is cool, add it to the cream cheese mixture. Then pour the whole shebang on top of the biscuit base and bake in the oven for about 30 mins on 160C. Third stage: once the cheesecake is cool and has been in the fridge for a couple of hours, whip together 100g of mascarpone cheese and 20g of icing sugar. Then add in 100ml of whipped double cream, and cover the whole cheesecake with this topping. Pop it back in the fridge to set overnight.